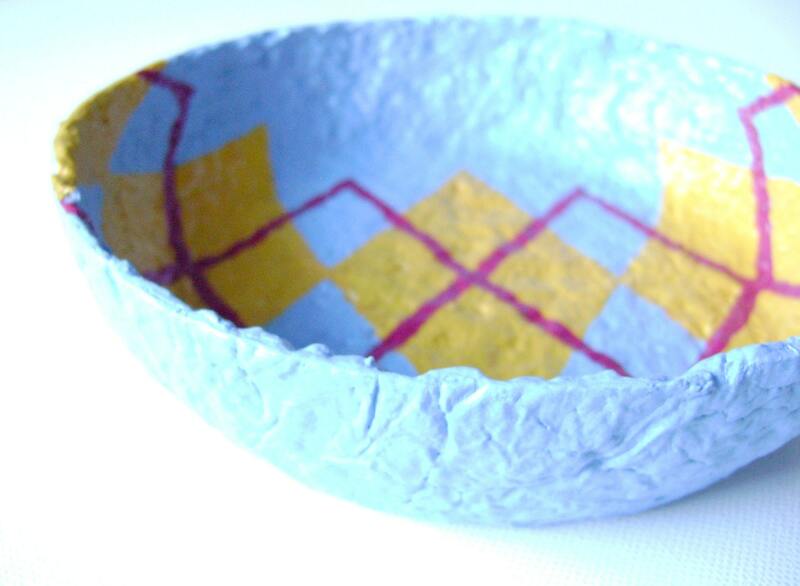 This preppy argyle decorative paper mache bowl is handmade from recycled paper pulp. Art bowls make a great statement on their own or they could function as a candy dish (wrapped candies only), a catch-all for keys or change, or use to display a favorite collection of little items. I like to use these as project bowls: stashing embroidery floss, scissors, and what-not in the bowl to take it on-the-go! Great for storing anything small and numerous!! This striking bowl also makes a wonderful gift. This bowl is painted a bright light blue with yellow and magenta diamonds in an argyle pattern. Due to the handmade nature and materials, all art bowls are one-of-a-kind and have a unique texture all their own.